Social skills are key for everyone to learn at an early age. Through social play children learn how to interact with those around them, build friendships, learn empathy and develop their communication skills, verbally and non-verbally. 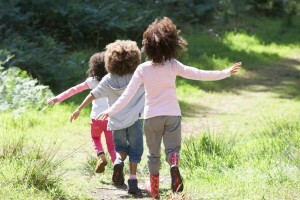 Playing with others can also teach children about co-operation and trust. Social skills are a crucial life skill that affect every aspect of a person’s life, through the connection they create for children with their teachers, family and the friendships they build with peers. Social play is any play with two or more people taking part. Social games are fantastic for bringing family and friends together and often have rules to follow which teach children about instructions, rules, boundaries and the concept of winning and losing. Social activities teach children about sharing, turn-taking, cooperation, leadership skills and how to resolve conflict, without them even realising that they are learning! As children interact more with one another whilst playing they learn valuable communication skills; verbal and non-verbal (body language and expressions). Being able to effectively communicate with people is a powerful skill and relies on a child being able to say what they want, listen to others and interpret what goes on around them- and playing does just this! Through social play children learn to detect body language; deceit, anxiety, danger, affection, concern and a whole host of other emotions, which are all required to understand the true meaning of the words and is a skill needed for adult life. Communication is not just about the words you use, but also about the way you’re speaking and your body language. There are two types of communication that a child needs to learn: verbal communication (the spoken word) and non-verbal communication (such as body language and expressions). Being able to effectively communicate with people is a powerful skill and relies on a child being able to say what they want, listen to others and interpret what goes on around them. Children naturally develop both of these types of communication when they play with others. Verbal communication is the way in which a child learns to understand and produce language in order to communicate, things like talking singing and reading can help develop this skill. A child learns to listen to what is being said to them and how to respond properly to ensure people understand them, for example, listening and learning the rules of the game. Non-verbal communication is the first form of communication a child uses; during their first year of life babies convey their wants and needs entirely through non-verbal communication such as crying, laughing, facial expressions and full body communication. This type of communication teaches a child to detect deceit, anxiety, danger, affection, concern and a whole host of other emotions – these are all required to understand the true meaning of spoken communication. Children learn this skill from their first months as they look to their parents as their first playmates; they do this by learning to recognise facial expressions, happiness, laughter or frowning. Children will continue to become better at understanding what people are not saying as they play with family, friends and classmates. Peek-a-boo whilst changing faces with each “reveal” can help to familiarise your child with different facial expressions.